In 1956, The British Columbia Dieticians Association (BCDA) registered under the Societies Act. The BCDA organized to seek legal recognition for Dieticians, establish professional status for Dieticians, and monitor the practice of dietetics in British Columbia. The Association provided a variety of services for the province of British Columbia such as training and demonstrations in health education. In 1981, the BCDA changed its name to the British Columbia Dieticians and Nutritionists Association (BCDNA). The Association divided its membership into Active Member, Honorary Life Member, Honorary Charter Member, Advisory Member, and Qualifying Member. To achieve membership, individuals must have received a university degree in Nutritional Science from a recognized institution. The society did not recognize practitioners of dietetics that were not members. The Association consisted of a President responsible for chairing meetings, working with the Treasurer, and ensuring that the Association met all resolutions and orders. A Vice President also assisted the President, and assumed the Presidents duties when the President could not complete their duties. A President Elect also became acquainted with the Presidents duties throughout the year. A secretary managed minutes, membership, and notices. A Treasurer collected fees and managed all financial matters. A Board of Directors including the Honorary President, President, Vice President, President Elect, Past President, Secretary, and Treasurer presided over the Association. The Society also maintained an Executive that included a President, Vice President, President Elect, Secretary, Treasurer, and two or more members appoint by the President to the Board. The Association sustained a Nominating Committee, Membership Committee, Career Guidance Committee, Continuing Education Committee, Publicity Committee, Program Committee, Administrative Committee and a Financial Committee. The Association also made an effort to preserve their documentary history. Each year, the President ensured that executive meeting minutes were kept. 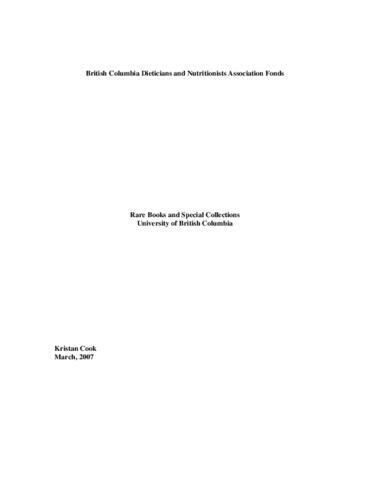 On November 2, 2002, the BCDNA had its vision realized: the College of Dietitians of British Columbia was established under the Health Professions Act through enactment of the Dietitians Regulation. Bylaws for the College were approved by the provincial government on December 11, 2003, and on April 1, 2004 the College became the legal authority for the regulation of dietitians in British Columbia. Textual materials were removed from binders for preservation purposes. Identification of individuals in the photographs is based on the handwriting of BCDNA members attached to photographs.